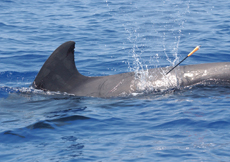 In 1986, a young biologist from the University of Cambridge proposed a new method for studying the genetics of the killer whale population of the Pacific Northwest: using darts fired from a crossbow to collect small pieces of tissue from free-swiming orcas. Although the scientist duly applied for and received a research permit from the U.S. government, as required by law, the study never took place. Instead the scientist and the government agency that issued the permit became embroiled in a lawsuit filed by Greenpeace, which argued that the risks of darting outweighed its benefits. Faced with a court injunction, the scientist abandoned his plans. Biopsy darting would eventually be used for research on orcas, but it would remain controversial, particularly in areas such as the Pacific Northwest with resident orca populations, strong environmental movements, and economically significant ecotourism industries. Most studies of killer whales would continue to rely on less invasive techniques. This episode is an example of a much broader phenomenon in the history of biodiversity science in the second half of the twentieth century: the reshaping of knowledge-making practices by ethical and environmental concerns. We know very little about how and why such concerns became embedded in the work of field biologists in the late twentieth century, or why episodes such as the one recounted above—in which methods seen as legitimate within the scientific community were rejected or reshaped by environmental and animal rights activists—became increasingly common. This research project is motivated by the idea that this ethical-epistemological entanglement has shaped both what we know about and what we view as an ethically acceptable relationship to other forms of life. Building on existing studies of research practices and material culture in the laboratory and the field site, it seeks to highlight the increasingly central role played by ethical concerns, public scrutiny, and laws, regulations, and standards in late-twentieth-century scientific practice, particularly in the United States. It does so through archive-based studies of the work and thought of individual scientists and organizations as they evolved over time in response to new concerns about species survival and animal welfare, as well as through in-depth study of the regulatory process, which reflects changing mores and expectations. The project consists of several strands, each concerning a different aspect of this ethical-epistemological entanglement. One strand addresses the ways in which views of scientists’ responsibility for the protection of endangered species have changed over time, generating new roles for scientists as well as for the general public and government regulators. In the United States, concern about the survival of endangered species can be found as early as the turn of the twentieth century, along with worries on the part of scientists that such concern—manifested in bag limits, wildlife refuges, and other restrictions on the killing of certain species—might constrain their ability to produce new knowledge. But a significant turning point can be identified in the 1960s and 1970s, when a host of new environmental protection laws were enacted and older laws were strengthened or enforced with new intensity. Biologists played central roles in justifying and formulating these new laws, but they were unable to control them completely, often finding that rules that had seemed acceptable on paper became burdensome in practice. This strand of the project traces their efforts as well as those of environmentalists and animal rights activists to reshape the regulatory system in their favor, with each group claiming that they had the best interests of animals and the environment at heart. Conservation biologists were hardly the only ones during this period to become subjects of heightened scrutiny because of the risks and harms of their research practices, nor were they the only ones to struggle with the formal, bureaucratized regulatory systems that resulted and with the interests groups and members of the public that contested them. In the second half of the twentieth century, as government support of science expanded dramatically, research in numerous disciplines came under new forms of regulatory control. This development was so general, affecting fields as different as physics and psychology, that it cannot be tied to scandals arising within any single discipline or to the concerns raised by any particular social movement. 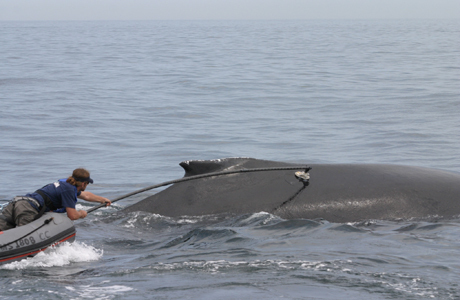 Biopsy darting is now a commonly used technique, but it remains controversial, particularly when used to study whale populations that are closely observed by tourists and local residents. Photograph by Wayne Hoggard. Courtesy of the U.S. National Oceanic and Atmospheric Administration. A second strand of this project therefore attempts to explain the rise of regulatory approaches to managing risky scientific practices during this period across a wide variety of disciplines and to determine what remained common and what changed according to discipline. In March 2012, a workshop on Regulating Research was held at the Max Planck Institute for the History of Science to bring together experts in the history of the formal regulation of scientific practice in both the United States and Europe. The discussion addressed empirical studies of such diverse fields as anthropology, archaeology, biomedicine (including both human and animal subjects), chemistry, and field biology as well as more general theoretical contributions. Ongoing work is examing the specific ways in which regulatory regimes have dealt not solely with the risks identified by scientific research but also with those risks directly produced by it. While one goal of this project is to explain the emergence and development of a regulatory regime for science, another is to use the regulatory record itself as a new source of historical evidence. The regulatory record includes both the issuance of new regulations and decisions on particular cases and offers a unique source of insight into changing research priorities and ethical concerns. This record is particularly rich in the United States, where a strong faith in the value of transparency, tied to skepticism toward centralized government, led to the publication and dissemination of documents that in many other nations have remained internal to the regulatory process. A third strand of this project therefore uses permit applications and other regulatory notices as a source of information about changing practices, research orientations, and social networks within conservation biology. For the most recent period, these notices are available in electronic form that can be automatically processed to extract meaningful patterns, such as the geographical distribution of researchers and field sites, the species and taxa that have received the most attention, and the kind of research methods that have been proposed. In combination with the qualitative historical work described above, this data allows for quantitative measures of the changing character of conservation biology over time. In sum, this project concerns the ways in which social values and norms come to shape knowledge-making practices. It seeks to show how ethical concerns, embodied in formal systems of rules and regulations, have shaped what it is possible to know, and particularly how enviromental and animal welfare concerns have reoriented the work of field biologists in the past half-century. Among other results, the project has shown how changes within conservation biology were part of a much broader regulatory turn in the governance of science, and how the rise of regulation helped produce a new political self-consciousness among field biologists. Current work is focused on determining the epistemological impact of these shifts, i.e., how the goal of biodiversity conservation has shaped what we know about living things and ecosystems, including the complex, politically significant databases of endangered species that have been built since the mid-twentieth century. This project has been conducted within the framework of the Sciences of the Archive project in Department II of the Max Planck Institute for the History of Science, under the direction of Lorraine Daston, and in close relation to its working group on Endangerment and Its Consequences, led by Fernando Vidal, now at the Autonomous University of Barcelona. Software for extracting and mapping information from regulatory documents has been developed in collaboration with Dirk Wintergrün and the Information Technology team at the Max Planck Institute for the History of Science.